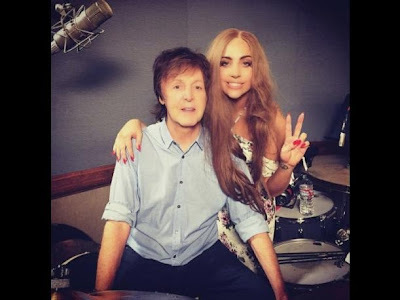 After his recent collaborations with Kanye West and Rihanna, Paul McCartney has decided to try his luck with another current music icon, Lady Gaga, in a musical collaboration that the artist has decided to document through Instagram. "I had a lovely meeting with Sir Paul McCartney and other friends," Gaga wrote on her official page with a picture where she appears together with former Beatle in a room full of musicians, including guitarist Mike McCready of Pearl Jam. "We are working in one of several secret projects. Incredible musicians, great atmosphere and lots of laughs" said the singer. The "Poker Face" and "Paparazzi" singer also published another photograph that appeared McCartney and her alone and where she remembered the first time they were able to chat. "Whenever I amuse myself by my friend. I'll never forget when I called last year to work together and hung up because I thought it was a joke," said Gaga. McCartney worked with Kanye West on the track "Only One" and just work with Rihanna and West in the newly released "FourFiveSeconds". The three perform together this Sunday at the 57th annual Grammy Awards, to be held at the Staples Center in Los Angeles (California).